In injection molding, there are two critical “material” choices that need to be made: which plastic material to make the product out of, and which tool material to use when building the part’s mold. Each choice has many options, but to add to the complexity, the resin selected can impose significant constraints on which tool material should be chosen. In this article, we’ll briefly discuss the important considerations that must be weighed when choosing the material for your mold. We’re not going to give a comprehensive review of all of the alloy choices available on the market, but instead we’ll give an overview of the main metallic categories. What’s Important for This Part? How long does this tool need to last? Put another way, how many parts does the tool need to produce over its lifetime? Are there generational changes expected that would warrant a new tool versus changes to the existing mold or cavities? What’s the required surface finish? Does the part need to be textured or are you trying to make parts with high optical quality that must be flawless? If it’s the latter, your options narrow considerably since not all tool metal can provide or maintain a very smooth, high-gloss surface finish. What’s the cycle time you’re shooting for? Of course, this is directly tied to the EAU (estimated annual usage), number of cavities per mold, the injection pressure of the machine you’ll be using, etc. Tool material can have a huge impact on cycle time because the available choices vary widely in thermal conductivity. What tooling materials are compatible with your plastic? A metal that offers the best corrosion resistance is best used with a corrosive resin like PVC. Another tool material can offer better resistance to erosion from something like a glass-filled nylon. These are key reasons why the resin should always be chosen before the mold material. A contract manufacturer with experience and a highly skilled team of engineers should be able to help you determine what resin is the most appropriate for your project so that you can then decide on the tool’s material. What’s the proper balance of up-front costs vs. maintenance costs? If your expected production volume is only a few hundred or a thousand parts, long-term maintenance might not be an issue. Cheaper tools are often the ones with the shortest lifecycle, so in cases where limited quantities are all that’s needed, this might be a trade-off worth making. If you plan on making millions of parts from a single mold however, a higher upfront cost might be the better choice. The initial expense of investing in a steel mold should hold up well without repair or extra maintenance procedures, and can help bring in an ROI over the life of the tool. Now, let’s discuss the characteristics of a few common tool materials. Hardened steel: Without a doubt, this is the costliest option, but it also provides the longest tool life. Its wear resistance makes it a better choice for a project that needs to use an abrasive glass-filled resin. H-13 is an example grade, with a Rockwell Hardness from 48 to 52 and available with a surface finish up to SPI A-1. Compared to other alloys however, hardened steel has a relatively low thermal conductivity, which means you might need to have extra attention focused on cooling (possibly requiring additional coolant channels or even beryllium copper inserts). Hard Stainless Steel: Stainless is much more corrosion resistant than other steel, which is good if you’re running water through cooling channels or using a corrosive plastic like PVC. Its thermal conductivity isn’t great, but it can provide a high quality surface finish for the part. Pre-hardened steel: Offers less wear resistance than “post” hardened steel (discussed above), but is used for lower volumes or large parts due to its lower cost. 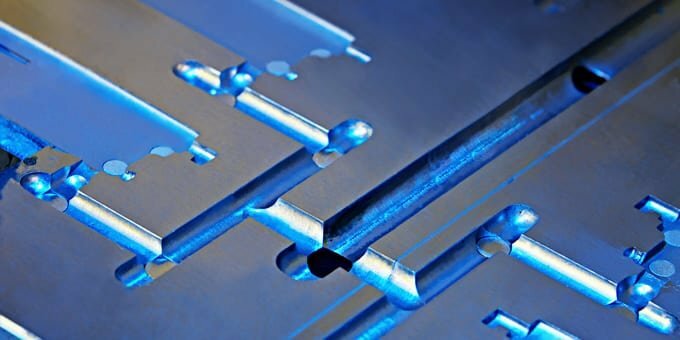 Aluminum: Aluminum molds cost much less than the others, but if properly maintained, it can produce hundreds, even thousands of parts with no apparent issues. Aluminum also has a much higher thermal conductivity compared to the various types of steel, which results in a faster cool down and solidification of the resin, offering shorter cycle times. On the other hand, aluminum is much softer than steel making it much more susceptible to damage which can lead to unexpected, expensive repair costs, and the costs incurred by excessive downtime. Keep in mind, extra maintenance procedures will have to be performed on any tool made out of aluminum, so expect there to be a cost tradeoff involved here. Beryllium Copper alloy: Due to its very high thermal conductivity, this alloy is used in areas of the mold that need fast heat removal. Using beryllium copper inserts in a steel mold provides one of the main benefits of aluminum, but with the longevity of steel. Generally speaking, the harder steel provides a better surface finish over a longer period of time. Although for some applications, smoother might not equal better. If your part is a handle for example, you may actually want a textured surface so that the user gets a better grip. It’s also generally true that the harder steel has lower thermal conductivity, lower maintenance costs, and higher initial tool cost. These generalizations gloss over many of the complexities of how your tool material choice can impact your cost per part, cooling and overall production costs. That is why it’s critical to have a knowledgeable and experienced contract manufacturing partner to walk you through every trade-off and technical detail of your project, making your design a physical reality. Providence knows all facets of injection molding, including mold material selection.